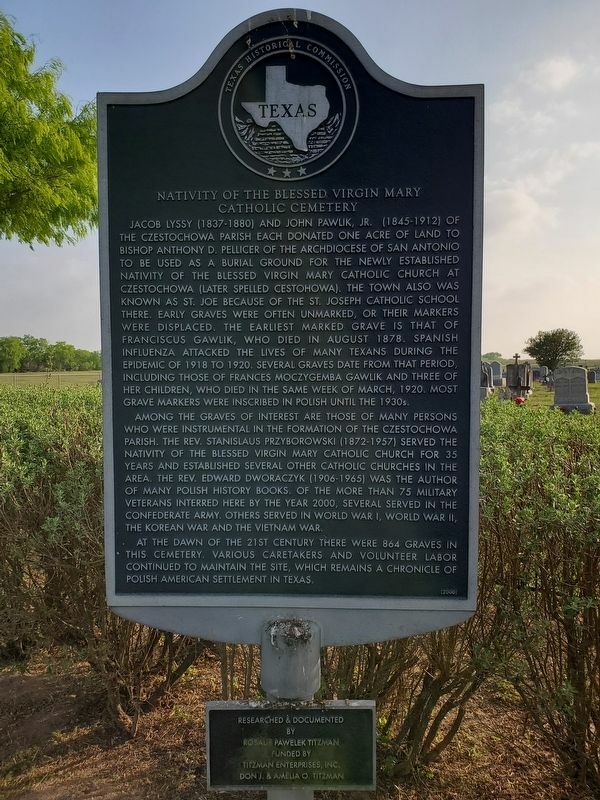 Jacob Lyssy (1837-1880) and John Pawlik, Jr. (1845-1912) of the Czestochowa parish each donated one acre of land to Bishop Anthony D. Pellicer of the Archdiocese of San Antonio to be used as a burial ground for the newly established Nativity of the Blessed Virgin Mary Catholic Church at Czestochowa (later spelled Cestohowa). The town also was known as St. Joe because of the St. Joseph Catholic School there. Early graves were often unmarked, or their markers were displaced. The earliest marked grave is that of Franciscus Gawlik, who died in August 1878. Spanish influenza attacked the lives of many Texans during the epidemic of 1918 to 1920. Several graves date from that period, including those of Frances Moczygemba Gawlik and three of her children, who died in the same week of March, 1920. Most grave markers were inscribed in Polish until the 1930s. the area. The Rev. Edward Dworaczyk (1906-1965) was the author of many Polish history books. Of the more than 75 military veterans interred here by the year 2000, several served in the Confederate Army. Others served in World War I, World War II, the Korean War and the Vietnam War. At the dawn of the 21st century there were 864 graves in this cemetery. Various caretakers and volunteer labor continued to maintain the site, which remains a chronicle of Polish American settlement in Texas. Location. 29° 0.415′ N, 97° 56.178′ W. Marker is in Cestohowa, Texas, in Karnes County. Marker is on County Road 245 0.3 miles south of Farm to Market Road 3191, on the left when traveling west. Touch for map. Marker is in this post office area: Falls City TX 78113, United States of America. Touch for directions. Other nearby markers. At least 8 other markers are within 5 miles of this marker, measured as the crow flies. Nativity of the Blessed Virgin Mary Catholic Church (approx. 0.3 miles away); El Fuerte del Cibolo (approx. 0.3 miles away); First Store in Panna Maria (approx. 4.1 miles away); Pilarczyk Store (approx. 4.1 miles away); Panna Maria, Texas (approx. 4.1 miles away); Town of Panna Maria (approx. 4.1 miles away); Immaculate Conception Church (approx. 4.1 miles away); St. Joseph's School (approx. 4.2 miles away). Touch for a list and map of all markers in Cestohowa. More. 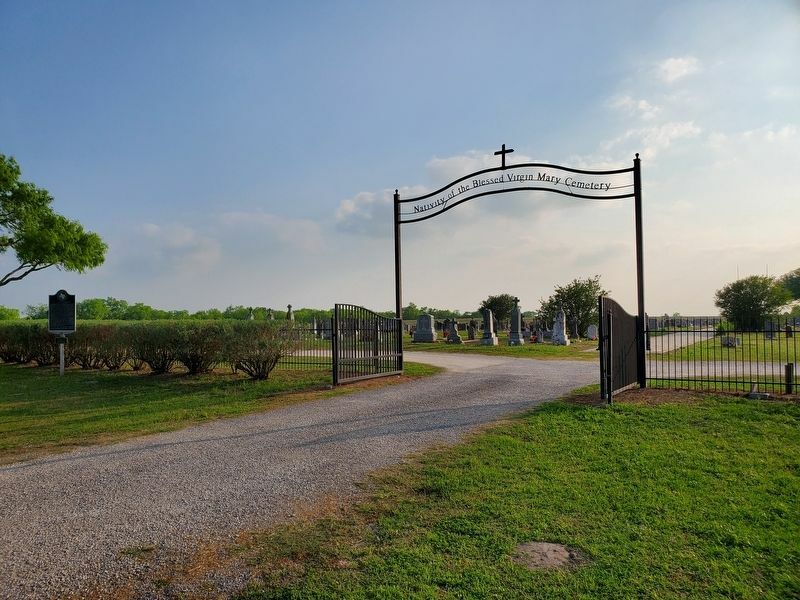 Search the internet for Nativity of the Blessed Virgin Mary Catholic Cemetery. Credits. This page was last revised on April 9, 2019. This page originally submitted on April 9, 2019, by Brian Anderson of Kingwood, Texas. This page has been viewed 33 times since then. Photos: 1, 2. submitted on April 9, 2019, by Brian Anderson of Kingwood, Texas.